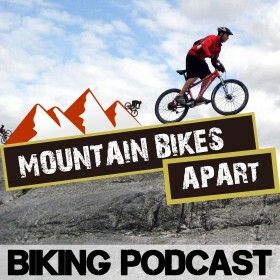 It’s the penultimate episode of this season of the Mountain Bikes Apart podcast! In this one, Tom talks about becoming the British National Mountain Bike Marathon Champion and we answer a question from Norbert about how to get better at jumping without killing yourself in the process. Tom kicks off by telling us about the best race of his career so far, where he won the British Mountain Bike Marathon National Championships on the Isle of Man. The marathon discipline is the longer duration equivalent of the cross-country olympic discipline. Tom’s race was won in 5 hours and 16 minutes, and took in 10.7K feet of elevation, so it was no mean feat! He can now wear the national championships jersey for an entire year and will be heading to some more marathon-distance races than usual both in the UK and throughout Europe in order to represent the stripes as best as possible. This episode’s listener question comes in from Norbert, who wants our opinion one learning to jump. It’s a great question as jumping is a skill that most mountain biker’s eventually want to improve, but it can be tough to know how to progress without taking things too far and crashing! Whilst Colin and Tom aren’t the most well-known jumpers in the MTB scene, they do have some advice for those looking to get better at getting air time. The first is that it’s best to start out with drops rather than jumps, beginning with 1-2 foot drops and working up from there. This will get you used to the sensation of being airborne and the idea of shifting weight backwards to unweight the front of the bike. The next step up is then to find some table tops jumps to practice on, i.e. jumps that have a flat section on the top, and a downslope on the other side, so that you can get used to getting air on the take off. Starting slow and learning the technique of lifting the front wheel and arching the bike so that the front wheel comes back down and matches the angle of the downslope is the way to go. You can then gradually pick up the speed and start going further with your jumps, eventually landing on the other side of the table top jumps and taking your new skills to gap jumps and bigger take offs. What are your tips for mountain bikers learning to jump? We’d love to hear them and share them with the listenership, so be sure to send them in! Colin and Tom would love to hear your feedback on the podcast as we head into the next season of the show. What did you like about this season, and what didn’t you like? Is there something we can improve on or a particular topic you’d like us to cover in the next season? Let us know by getting in contact via Twitter or via the website at mountainbikesapart.com. We’ll see you next time on the final show of this series!